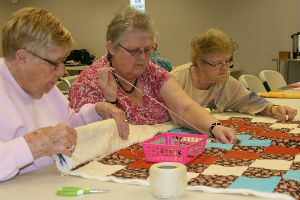 For the 29 East Rockingham Senior Center members in attendance on April 29, everyone had an opportunity to at least view the six beautiful lap quilts sewn by ladies of the Elkton United Methodist Church and many had a chance to lend their hands in tying several for distribution. The workshop, let by Floe Koontz and Marie Frey, is an annual event at ERSC, and the bonus is that all six of the miniature quilts (lap robes) will be given to ERSC members and one Meals on Wheels client! The nearly 90-minute workshop had us in awe of the beautiful patterns and colors and eager to assist. Mrs. Koontz and Mrs. Frey, both retired educators, lead this service project with other ladies at Elkton UM Church, and make dozens of the lap robes for distribution to their church family, many of whom are hospitalized or recuperating from illness. Since the ERSC Director attends church with these ladies, she approached them several years ago about offering the workshop, which was warmly received by Mrs. Koontz and Mrs. Frey. However, the ladies’ generosity was totally unexpected, as far as offering several of the quilts to us for our members. Today’s workshop certainly allowed many of the members to reminisce about when they learned to sew, who taught them, and how much they have enjoyed or continue to enjoy this activity. Once Mrs. Koontz and Mrs. Frey put the finishing touches on the quilts, we hope to have a group photo of the recipients!